A cylinder is a right circular prism. It is a solid object with 2 identical, flat, circular ends, and a curved rectangular side. 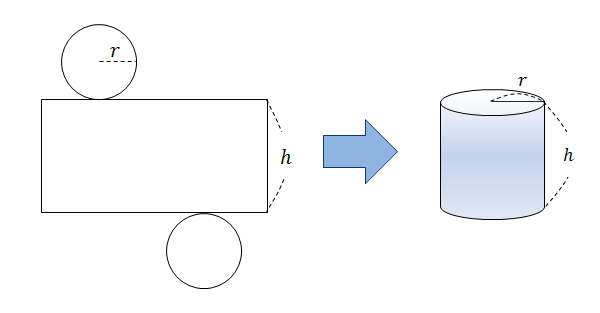 Note: Sometimes, the definition of cylinders may not require having a circular base. In such cases, the base shape will need to be given. The above definition is then called a circular cylinder. What is the surface area of a cylinder whose base is a circle of radius 3 and height of length 4? Suppose that the sum of the areas of 2 identical circular ends in a cylinder is the same as the area of the curved side of the cylinder. If the radii of of the flat circular ends are each \(r,\) what is the height of the cylinder?